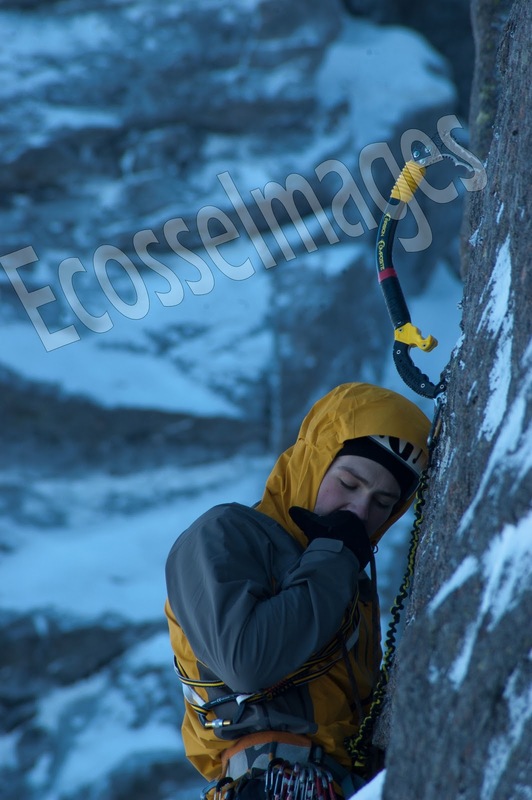 A few weeks ago, while sitting on the belay ledge below the top pitch of “Omerta”, I witnessed Andy Turner top out on the 2nd ascent of “The Hurting”. This route had been in my thoughts for a while, but the bold start had made me hesitant. However, seeing Andy top out was so inspirational that the psyche was building to a sufficient level to give me the final push. So I decided to give it a try. Last Saturday, with a good weather forecast and a willing belayer, Ken Lacey, I headed into Coire an t’Sneachda and up to the base of the big imposing wall. On the way into the coire I was hesitant and nervous, not for the upcoming climbing but worried whether or not, due to the recent thaw, that I would find the route in condition. Thankfully when the wall came into view, I could see that the route was in good nic, with neve on all the ledges and a good dusting of the white stuff….. It was game on! Trying to warm up my hands on my first attempt. After a long drawn out battle of mind and stamina I had finally figured out how to reach the mid way ledge under the roof and started to make the thin moves high above my last runner. Unfortunately the ledge was sloping and I couldn’t seem to figure out how to get any higher, the fear soon set in as the prospect of falling from this place was not high on my list of things to do. My last runner was good, but it would not have stopped me from bouncing off the lower ledge on my way down. Thankfully, using some very thin ice hooks and some dodgy smears for my feet, I managed to get under the roof and find some well needed good gear placements …..Ahhhh……And Relax! Even though I now had ok runners, my mind was still running wild with the prospect of the steep overhanging crack that loomed ahead. Not wanting to get cold, I gathered my psyche and swiftly set off up the head wall above. This was very short lived, as when I pulled over the lip of the roof on a thin hook, I got my feet high, but then my axe ripped and I ejected myself backwards into the air. My next words should not be repeated before the watershed! Thankfully Ken offered to rapp off and retrieve my gear. I was very grateful of this, as I really wanted to get this route ground up. On the walk out I had decided in my mind that the route was too scary to try again anytime soon. I then made the slow drive home with the moment of the axe ripping, playing over and over in my mind. The next day I checked the weather, and saw that on Tuesday the sun would be shining and there would be very little wind. All my previous thoughts about not getting back on the route went straight out the window and I swiftly made plans to return for day two on “The Hurting”. I had arranged to climb with someone who I had not met before but he sounded cool and I’m always psyched to meet new climbers. 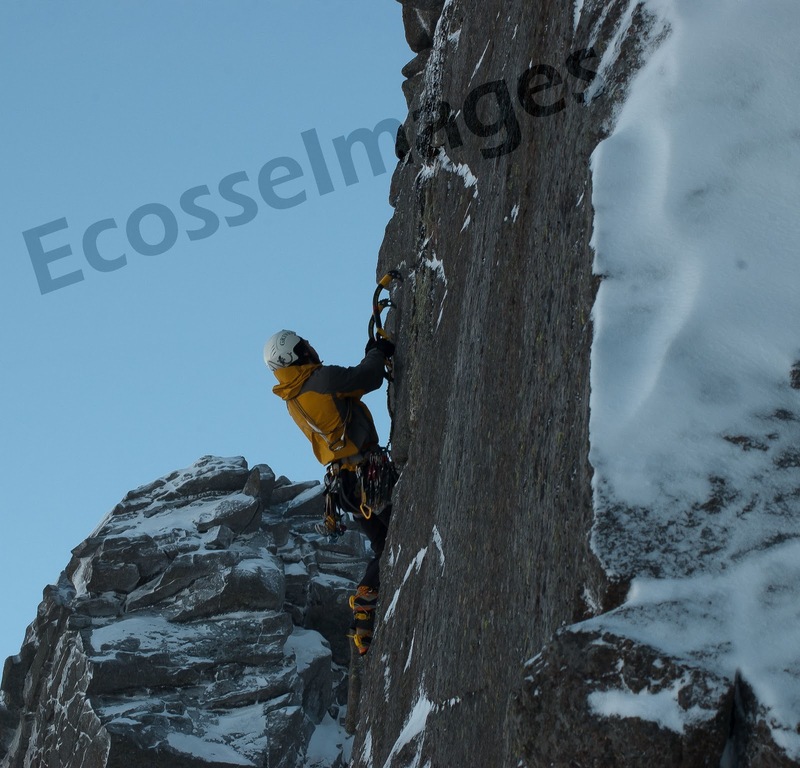 When I met Erik in the Cairngorm car park, it was obvious that he was psyched and keen, but the weather forecast was very wrong and the 80mph winds and snow did not fill me with confidence for the upcoming days climbing. Starting up the route, I soon realised that all the useful neve and ice had now gone from the ledges and the starting moves felt even harder and scarier than two days before. Now having to rely on very small rounded edges and smeary feet, which was made all the worse by the strong wind gusts buffeting my feet from the tiny placements and on one occasion left me hanging from only one tiny pick placement with no gear between me and the ground. I soon regretted getting back on the route in that weather, but it was too late to retreat. I pushed on and eventually found myself at my previous high point, but this time I got my pick seated a little better and managed to yard my way onto the headwall and into the hidden crack. I soon regretted this, as I was now well above the gear below the roof and I couldn’t see my feet due to the roaring spindrift that was shredding my eyes and face. 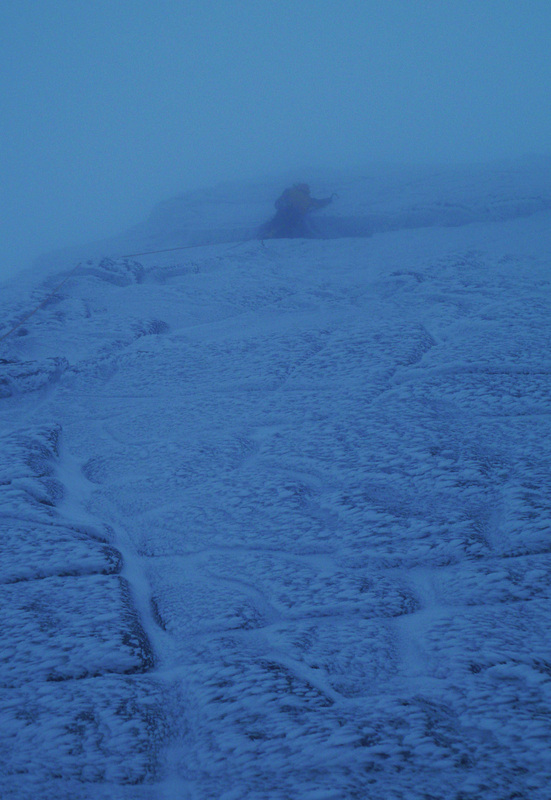 I fought as hard as I could to place a cam in the iced up crack while bracing myself against the strong gusts. I moved up the crack not knowing what my feet where on and reached into the blind seam above. As I reached up with my right axe, my left bicep was cramping from the cold, at this moment an almighty gust of wind hit me side on like a truck. Then the inevitable happened, gravity took over and I was falling through the air. Down again………. Erik swiftly offered to retrieve my gear and I gratefully accepted. He did this, then we high-tailed it out of there, back to the car. Now knowing that I was in with a chance of the prize, I was very eager and psyched to get back on the route as quick as possible. I checked the weather and it looked like Friday was going to be the best day (if the weather was correct). So I rang round some mates and arranged for my very good friend James Dunn to give me a belay. So yesterday I made the journey from Fife to the Cairngorms for the third time, hoping to get the route done. As we approached the bottom of the ski road hill, the trees were swaying furiously back and forth. My stomach sank, it was clear that the forecast was wrong again and the mountain was a mass of spindrift and wind as we arrived in the upper car park. I didn’t know what to do, I didn’t want to get back on the route and fail again because the spindrift was freezing up my eyes! After being pretty wiped out for the last couple of days from my recent cold/flue thingy, I decided that I needed to get out the house for some fresh air and do some training. So today I arranged to meet up with Ines, Charly and Hans for some mixed tooling action at Newtyle quarry (Dunkeld). When we arrived at the cave, Ines and Charly where pretty taken aback at how big and steep it was. But none the less they were keen to get stuck into the hard technical routes that this awesome venue has to offer. It was Inspirational to watch Ines warm up on and flash the hard M10+ “Fast and Furious”, which she made look about M5. After she had done this it was my go, and the pressure was on to try not to get shown up too much at my local training venue. Thankfully it all went smoothly and I also got the route clean on my first go of the day (phew). Next Charly had a go, but as he had never done any continental style mixed routes, he found it a bit hard to get his head in gear for the steep yards and fig of fours. So he worked the moves then came down. It was Ines’s go again, and this time she went for the steep M12 crack line “Training for Something”. This route was a little easier to read but it is also a lot stepper and has very big powerful moves at the start. She seemed to be cruising the route, until ¾ of the way up her axe ripped and she was left dangling in the air, and asked to be lowered to the ground. Again it was my turn to get cranking, so I also opted for the steep crack line. Unfortunately my fitness was no match for the former multiple world mixed/ice climbing champion, and I fell off halfway up the route. Even though the route was pumpy and hard, it definitely felt doable and I feel that I have just opened a new project worth training for. Charly then had another go on “Fast and Furious” and came unbelievably close to ticking the route on his third go, but it was not to be as he was sent flying through the air when his pick ripped. Ines went on to have a second go on the M12 and came off only a few moves from the chain when the foot holds ran out and the arm pump was too much. After a couple more laps on “Fast and Furious” I decided to call it a day. Charly then said he was going to give it one last shot, and much to his surprise he cruised the route all the way to the chain and lowered off with a big beaming smile on his face. All in all it was a good day and everyone was happy to salvage some mixed climbing even though the mountain routes are in bad condition. We weren’t the only people that where grateful for the quarry, as Andy Turner was also there. He was mostly on the easier routes today, continuing his mixed climbed course, but popped into the cave to say hi and to see what was going down.